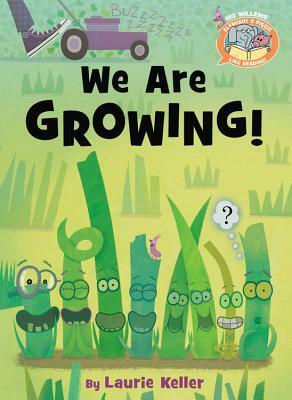 Summary: Several blades of grass are astonished that they are able to grow. Each one finds a reason to be superlative: tallest, curliest, silliest, crunchiest. Only Walt has trouble thinking of a word to describe himself. The other blades are supportive, but try as he might…nothing. Meanwhile, a lawn mower is seen approaching, and before long, all of the blades have gotten a surprise trim. No longer are they tall or curly. A couple of pink critters (slugs?) assure them that they will grow again, while Walt grabs a rake and suggests a clean-up. As he starts to rake, he realizes what he is…the neatest. 64 pages; grades K-2. Pros: Part of a new multi-author series, “Elephant & Piggie Like Reading”. Not only does this have the look and feel of an Elephant & Piggie book, but the famous duo is pictured at the beginning and the end, reading the book. The illustrations are simple and cartoony, with the whole story told in dialog. Sure to be immensely popular with the emerging reader crowd. Cons: Blades of grass just don’t have quite the personality of cute elephants and piggies.